If you trained with EDGE before, then you’ll know that with our zest for life, our training is not only informative, it leaves you feeling totally motivated and inspired! Whether you are continuing your NLP learnning for personal development, or to use in your business the next stage of learning will wow you at every level. 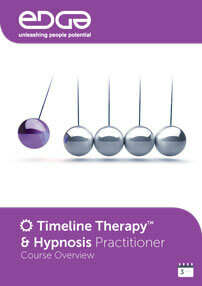 Time Line Therapy™ training and Hypnosis will teach you a collection of techniques that allows you to gain emotional control over your life and enable you to help others.